Our Engineering team provides fuel for world class tooling and precision molded components. Bring on the most challenging projects. Our exceptional engineering team uses a collaborative, systematic approach to conquer any challenge. Engineers specializing in design, tooling and molding work in concert on every project to ensure all requirements and expectations are not only met, but exceeded. Optimization of product performance, quality and economy is the highest priority. Our controlled scheduling and weekly progress reporting ensures on-time delivery and keeps you informed. We invite you to consult with our engineering staff in solving your injection molding problems and in the development of molding components to fit your requirements. 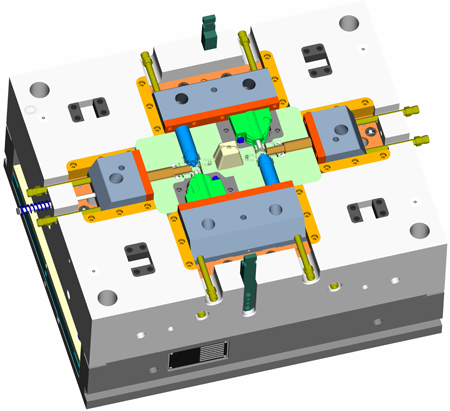 We offer complete 3D part design, mold design and detailed layouts utilizing Pro-ENGINEER software. Toolpath programming is accomplished with state of the art Delcam and Mastercam software.